Many believe in choices and in markets. But markets work effectively only when there’s a reasonable relationship between cost and price. The current $2.5 BILLION plan for the Durham-Orange Light Rail Train assumes 50% Federal funding, 10% state and 40% local. The 40% local funding is comprised of a 0.5% sales tax, $10 annual vehicle registration fee and 5% tax surcharge on car rentals, to be supplemented with massive debt and debt repayments for half a century until 2062. However, the NC General Assembly capped the state’s maximum contribution not to exceed $190 million (or 7.7%). Including debt payments (2062 and beyond), the total cost of the DOLRT project is estimated to be $3.4 BILLION. These estimates do not include the recent changes including the downtown Durham tunnel. And then you add the annual 80% taxpayer subsidy for ongoing operating and maintenance costs (“farebox recovery” is the actual fare paid by the rider and planned to be 20%, leaving the remaining 80% to be paid by the taxpayer). These lavish tax subsidies distort the market, are socially inequitable, and externalizes costs to others. Light rail projects require inordinately high capital costs, exorbitantly high operating subsidies at taxpayer expense and lack environmental benefits when compared to other alternatives including automobile or bus transit. The challenge is to find alternatives and technologies that could compete effectively with the flexibility of automobiles. Our current emphasis on monopoly public transit systems wedded to buses and trains, fails to prepare us and our community for the demands of the future. Light rail will entail perpetual federal subsidies, state subsidies, long-term bonded indebtedness against future revenues, plus ongoing operating and maintenance costs. A reviews of 30 LRT projects around the nation have conclusively demonstrated that all of them operate at a loss requiring average tax payer subsidies of 70%. The fare revenue does not offset the annual operating and maintenance costs. 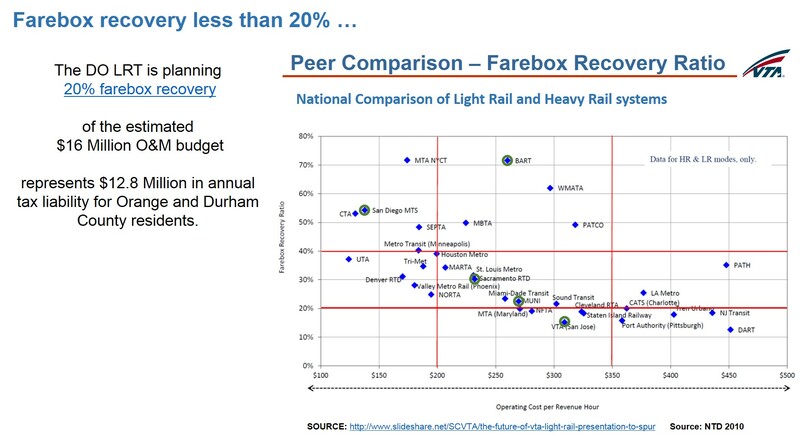 In fact, this same analysis shows that Charlotte riders only pay a mere 4.1% of the actual cost (with the taxpayer graciously paying for the remaining 95%) SOURCE: A NOTE ON RAIL TRANSIT COST-BENEFIT ANALYSIS: DO NON-USER BENEFITS MAKE A DIFFERENCE? This entry was posted in myth on August 28, 2015 by admin.